The military blog BACUFFZ is a blog about the latest things happening in the world of Medalcollectors, about new Badges, Medals and Cuff titles which are emerging on the market. Also news arround the collector area, new research results in the field of manufacturers and all sorts of interesting topics on the subject of phaleristics. So join in and have fun reading……. My Name is Sascha, I was born in the year 1971 and I am a soldier on active duty. In the year 1992 I started to collect medals and military items from World War II. During my sea duty I had the opportunity to visit a lot historical places from World War II in Europe which deeply impressed me. Back home on land duty I started to research more about medals / badges and also cuff titles. In 2005 I designed my first website about medals and every year it grew until I founded my shop www.emeredato.de. Besides that I wrote three books about cuff titles, the last one in 2016. In 2017 I sold my shop to the company Trave Military and now my new project it this military blog. 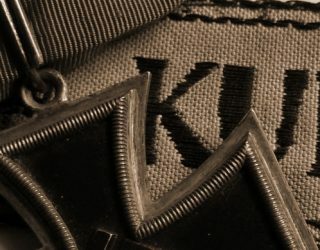 The Idea of starting a military Blog came to me after I checked a lot of military forums for news / interesting badges and cuff titles. To get interesting things together you have to search the net and read almost everything. With this blog I try to get interesting information together, so collectors from all over the world can stop by and read “what is going on“ in our collectors world. If you like, you can send me news or badges via email and I can also post them in my blog.